Battling Dark Age disloyalty and forging alliances in a campaign of highs and lows. One of Sid Meier’s most frequently quoted musings on game design is that games should be a series of interesting decisions. Civilization VI: Rise and Fall, the latest game’s first big expansion, feels like a reinforcement of that philosophy, restructuring each era—from ancient to modern—around big choices and important events in the history of a civilisation. It's a real shake-up of a system that's normally tied to technology, with each civ independently moving from era to era depending on the pace of their research. 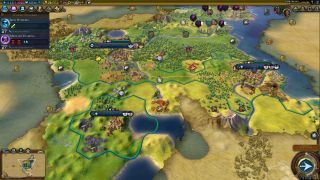 Now every civ reaches new ages at exactly the same time, but there’s still a competitive aspect. During each era, civs get points for historic moments, like recruiting unique units or founding a new religion, and at the end of an era these points determine whether the next one is going to be a normal, Golden or Dark Age. These moments can also be viewed in an illustrated timeline of the civ that shows some flavour text and the total number of points they added to the era score. So when you bid farewell to the ancient era and slide into the classical period, you’re not simply getting a notification that you’ve moved on and some new techs to research. Depending on your achievements in the first era, you’ll be able to pick a number of ‘Dedications’ that net you major buffs for the entirety of the next era. As the Cree, for instance, I decided that I desperately needed more builders so I could construct a Mekewap, the Cree’s unique building that adds extra production and housing to a tile. I selected the Dedication that allowed me to spend faith points on civilian units as well as religious ones, giving me another route to recruit some diligent builders. Despite getting a Golden Age at the first opportunity, my Cree nation didn’t fare as well when it entered the medieval era. Some problems with barbarians and a couple of lost wonder races left the civ’s notable moments somewhat diminished, ushering in a Dark Age, a period of turmoil. It’s possible to spread loyalty to your empire among other civs, seducing their citizens to your side and increasing the chances of the city defecting. The biggest problem introduced by Dark Ages is the deterioration of loyalty. Every city now has a loyalty meter, reflecting how happy its citizens are with being part of the empire. Low loyalty can lead to lower yields and thus slow growth and production in the suffering city; worse, it can ultimately cause revolts, with the city joining another empire or simply declaring its independence. Loyalty can also be exploited, however. It’s possible to spread loyalty to your empire among other civs, seducing their citizens to your side and increasing the chances of the city defecting. It's a lot like culture flipping from Civilization IV, and to a lesser extent V, where a unhappy cities could revolt and join the civ with the most culture. In Rise and Fall, cities automatically exert loyalty pressure on nearby cities, so even when you’re not focused on it, your propaganda machine is still ticking away. Dark Ages aren’t all bad. Nobody wants disloyal citizens, but there are some advantages to slumming it. Unique policies can be activated, for example, that give powerful bonuses but with high costs. Choose the Inquisition policy and you’ll beef up your religious units but at the cost of science. When being good at chemistry can get your burned at the stake, you’d probably pick a different career too. If the costs seem too great, you can ignore these policies entirely, but they’re a great way to keep up with the other civs if you’re willing to specialise. It might even end up being worth dealing with a Dark Age just so you can overcome it. If you get enough points to make the next era a Golden Age then you’ll enter a souped-up version known as a Heroic Age. There are consequences and new challenges, but hitting a Dark Age isn’t a failure. And if you’ve assigned some governors to your cities, you might barely even notice any disloyalty. A governor, in a 4X game, is typically just another name for automation. You can set their focus and then just forget about them. Rise and Fall’s governors have definitely grown out of that mechanic, but now they’re characters with progression trees and predilections. Not only can they foster loyalty amongst the citizenry, they can evolve into powerful tools that are able to transform cities into capitals of culture, industrial powerhouses, and stalwart citadels. Deciding to take advantage of the Cree’s handy trading abilities (more gold and food with every trade route, more trade route capacity, and a free trader when pottery has been researched), my first governor was Reyna, ‘The Financier’. Not surprisingly, money is her sphere of influence, and hiring her also made it easier to buy tiles and expand faster. With her influence and my trade routes, cashflow wasn’t an issue. By the time I hit turn 150, the end of the preview build, I’d managed to hire three governors and promote them all. When you are able to hire a new governor, you can also choose to promote an existing one instead. You level them up by picking and unlocking new abilities, just like you would a combat unit. There are seven governors in total with six abilities each. For my 150 turns I decided to take a friendly, diplomatic approach, knowing that the loyalty system gives my opponents new ways to screw me over and steal cities. Alliances have been given a makeover in Rise and Fall. Civilization VI unstacked cities, and now it’s unstacking diplomacy. Instead of just becoming buds with the civ of your choosing, you need to pick a specialised alliance connected to each of the game’s pillars: cultural, research, military, religious and economic. Within these specialised alliances are different tiers that represent how close you are to being total BFFs. You progress through tiers by earning alliance points. These are generated every turn an alliance is maintained, and there are ways to increase the yield—by sending traders to your ally's city, for example. The result isn’t just that diplomacy feels more varied, it’s now more proactive. Since you can only have one of each specialised alliance on the go at the same time, you need to make sure you’re picking the right civ for the specialisation. Who wants a military alliance with a chill pacifist who prefers missionaries over warriors? It’s worth finding out more about your potential pal, then, before you start pursuing them. Lamentably, the final new addition to the series, international emergencies, didn’t appear in my first 150 turns. Emergencies are big crises that can be solved by civs working together. It might be that a city state has been taken over by a civ, or maybe someone naughty is playing with nuclear weapons. Emergencies have objectives that must be completed before rewards are doled out and if those objectives aren’t reached then the civ that the emergency is targeting gets rewarded instead. Firaxis warns that it might not be worth the risk if the other civ’s reward is too great. Rise and Fall makes a lot of broad changes that fatten up existing systems with more interesting decisions and consequences, and in practice it feels more cohesive than the list of features suggests. But with a game as large as Civilization VI, 150 turns is just the tip of the iceberg, we'll have to wait and see how Rise and Fall's multitude of changes affects the entirety of a campaign when the expansion comes on on February 8.